One day on Mercury (i.e -the time it takes to rotate around its axis once) lasts 176 earth days. 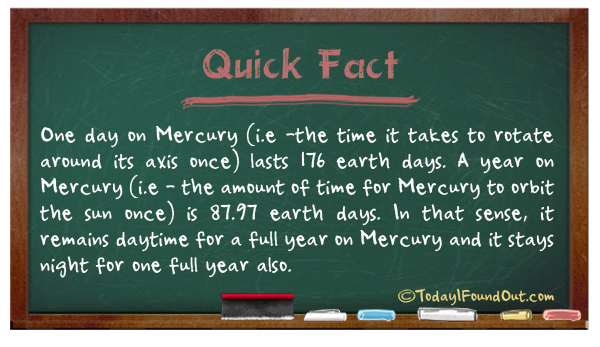 A year on Mercury (i.e – the amount of time for Mercury to orbit the sun once) is 87.97 earth days. In that sense, it remains daytime for a full year on Mercury and it stays night for one full year also. It’s actually Venus… not Mercury. @Nick D: No, it is Mercury. For those curious, one Venusian year is about 1.92 Venusian (solar) days long.